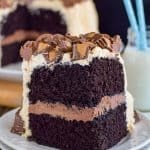 Layers of fudge and candy make this easy Reese’s Ice Cream Cake a stunning summer dessert for any party! So easy to customize with your favorite candies! This old recipe is such an easy dessert to put together for summer parties. Over the years I have learned so much about photography, so this delicious frozen dessert needed a photo update. You can see the old picture from 2010 at the bottom of the post. Every year our daughter asks for an ice cream cake for her birthday. 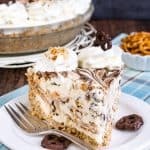 Over the years she has requested this Vanilla Mint Chip Ice Cream Cake and this Chocolate Chip Cookie Dough Ice Cream Cake. We have had so much fun making and devouring these easy cakes together. 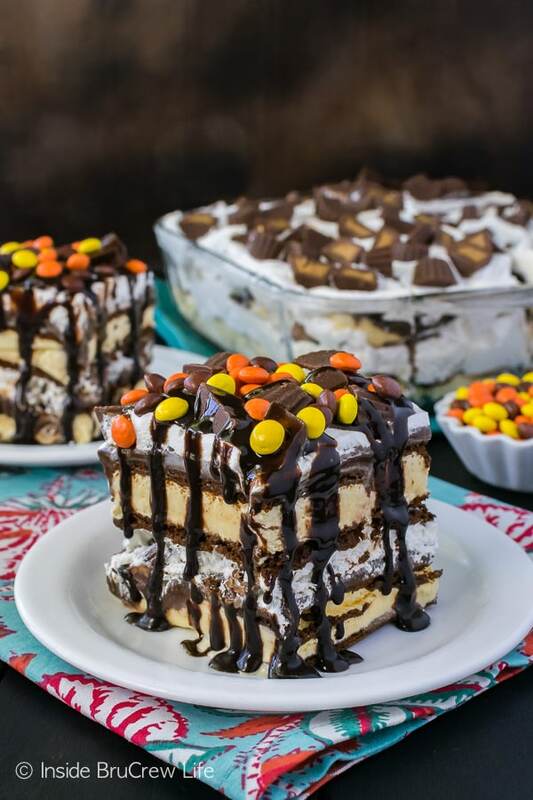 Layering ice cream sandwiches, hot fudge, Cool Whip, and candy bars makes an even easier cake for summer parties! Plus, they can be customized to your flavor satisfaction. 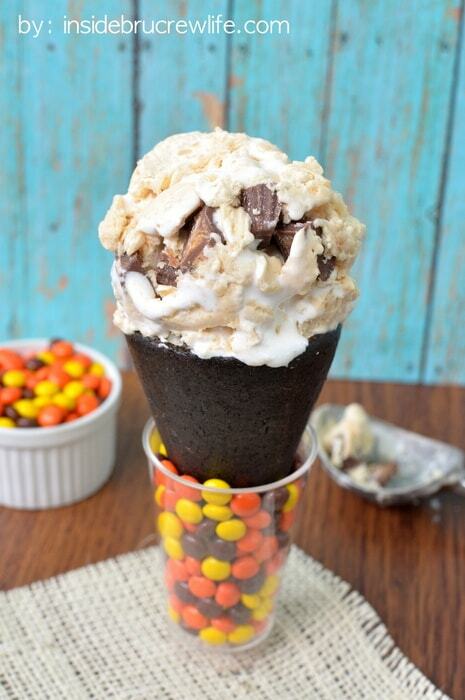 We like to use hot fudge and peanut butter cups because that’s how we roll around here. But just think of all the combos you could do! Caramel and Snickers. Marshmallow and Three Musketeers. 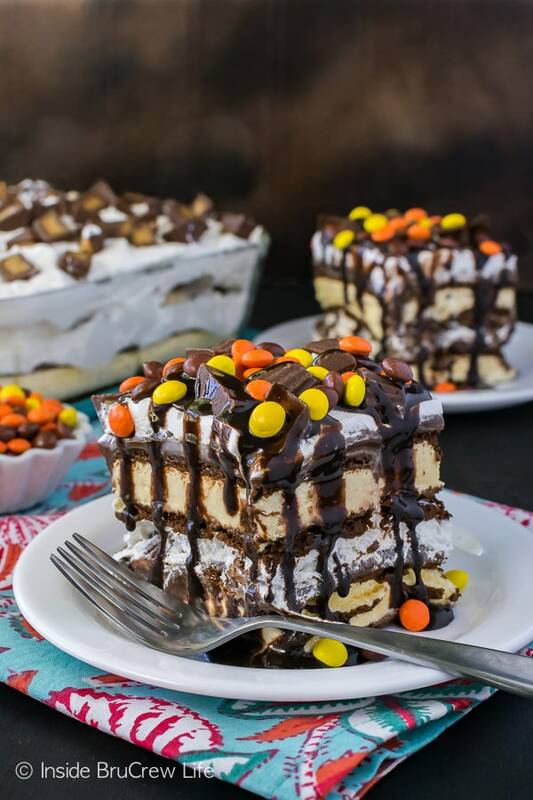 The hardest part about this ice cream cake is unwrapping all the ice cream sandwiches and layering them in the pan before they start to melt. I suggest just getting 8 sandwiches out of the freezer at a time. 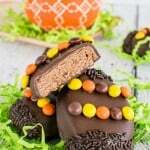 Unwrap those and spread a layer of fudge, Cool Whip, and candy and then freeze it for a few minutes before you start working on the next layer. Once you have it all layered together, cover it and put it back in the freezer. 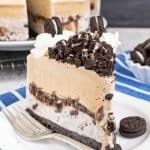 Yeah, more waiting time is involved in this easy ice cream sandwich cake recipe. I mean, you could just grab a fork and dive in, but the layers wouldn’t be as pretty. After a few hours everything freezes together, so that you can cut out pretty squares of frozen goodness! We like to drizzle our ice cream cakes with more chocolate and sprinkle it with some mini Reese’s pieces. More peanut butter and chocolate is never a bad idea in my world! 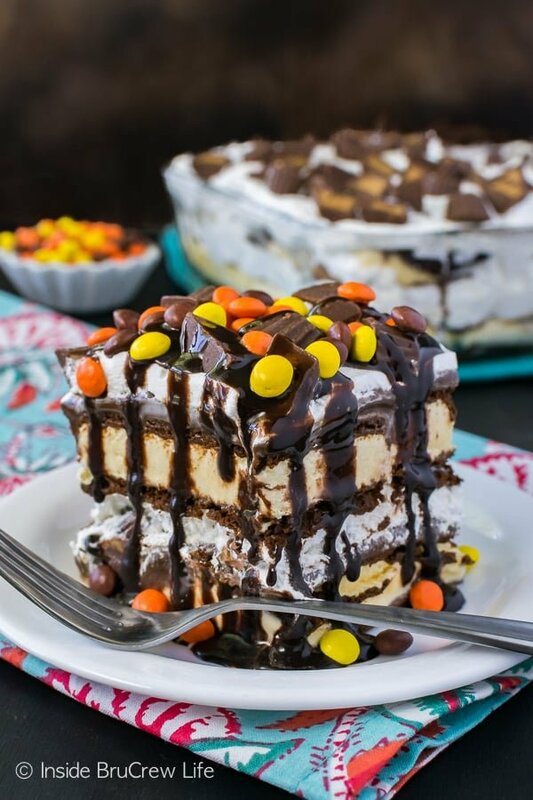 A big slice of this Reese’s Ice Cream Cake is a great way to cool off on a hot summer day! 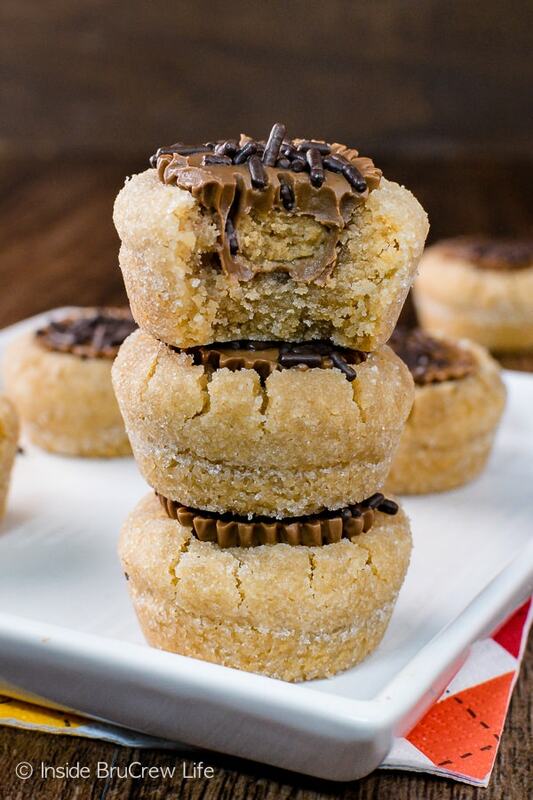 Check out these little Chocolate Chip Cookie Dough Ice Cream Bites! I’m pretty sure I could demolish the whole batch in no time at all. Feeling ambitious? 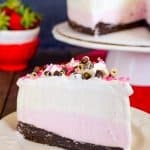 Make your own Homemade Ice Cream Sandwiches and then layer them together in a pan to make this cake. Think of all the fun combos you could do then! I’m also loving these pretty Tutti Fruity Frozen Yogurt Bars. A granola crust and lots of fruit frozen in each bar makes them a healthy option for hot weather snacking! 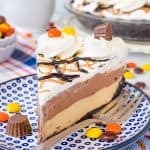 Layers of fudge and candy make this easy Reese's Ice Cream Cake a stunning summer dessert for any party! So easy to customize with your favorite candies! Unwrap the ice cream sandwiches and place 8 in the bottom of the lined pan. Spread the top of the ice cream sandwiches with 1/2 the hot fudge. Top with half the Cool Whip and 1 cup chopped peanut butter cups. Press the candies in. Repeat the layers with the remaining ingredients. Cover and freeze for 4-6 hours. Cut into 16 slices. 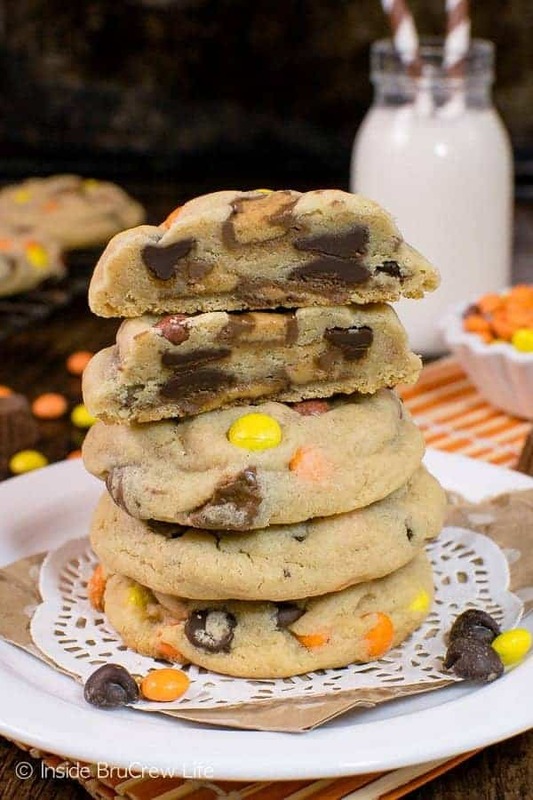 Serve with chocolate syrup and mini Reese's Pieces. So I am sitting in my cube at work so wishing you could blnk that bad boy to my desk. This would make a great afternoon snack! Oh my…this looks sooo good! So much better than the apple I am eating right now! Yum! My husbands birthday is Friday and im thinking this will be the perfect birthday “cake”! Please follow me back if you havn’t already. This looks great and I have a plan as to when I want to make it. One question– Could you say a little more about the hot fudge part? Would choc. syrup work? Hello I’m a new follower from WW. OH MY WORD! That looks awesome. i’m your newest follower from tta. hope you consider following too. How do you stay so teeny bitty with amazing eats like this all the time?! Saw you on Saavy Sisters’ blog hop. Just wanted to say hello. That ice cream sandwich delight looks almost too awesome to eat! Following you. Would love a follow back. I just found your blog and am looking around. 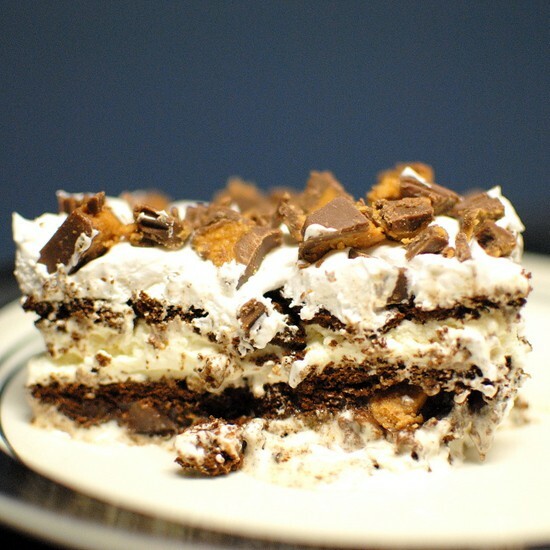 How funny that you just posted about an ice cream sandwich dessert – so did I. : ) It was a huge hit at my house! Stopping by and new follower from Quality Time’s link up. 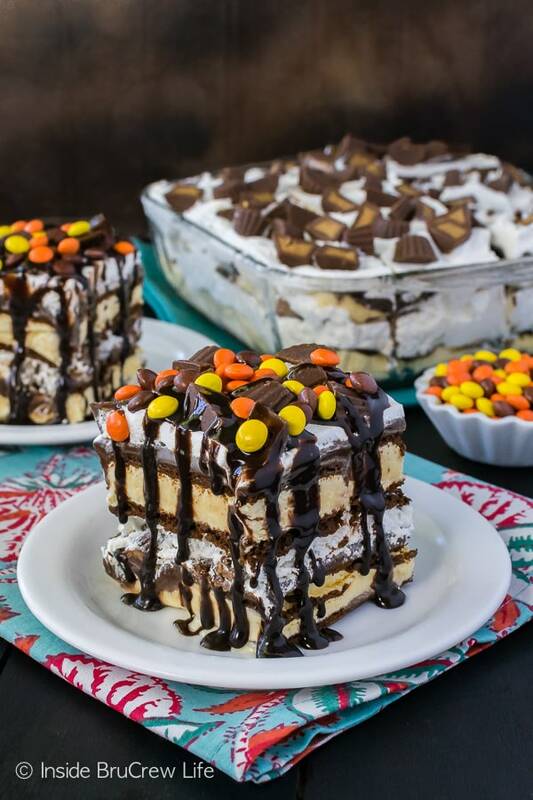 You had me at “layers of fudge and candy” — love that you can sub different types in here — tons of possibilities. Looks amazing! Fudge and candy gets me every time too 🙂 This is one of those awesome desserts with so many possibilities!! !